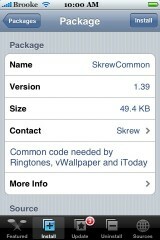 The update to SkrewCommon version 1.39 makes some nice changes to iToday. My favorite part of the update is that both the box and the screen are now scrollable. In the previous version, only the screen was scrollable. This adds a ton of functionality to the application. However, it is a little tricky getting used to scrolling just the screen and not the boxes. You have to scroll near the top or on the right of the screen. After a little practice, it is no problem. Both SMS and Call History have been added to the lockscreen. It displays the Date, Time and Contact from the last 10 Texts and Calls you have received. It also displays the actual message in the texts as well. I did notice that the calendar does not show reoccurring events. This bug was fixed with the last version of iToday but, it seems it is back in this version. I also have to tap on my Birthday box to make the Birthday’s display. However, overall, this is a pretty decent update. There were no changes in the Setting on the actual application. 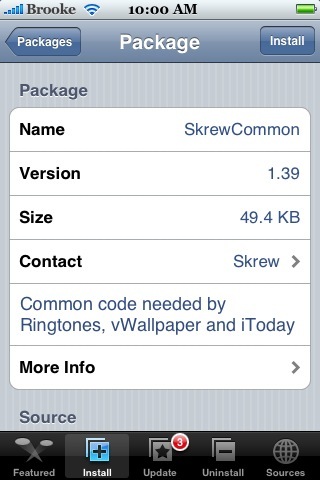 iToday and SkrewCommon are both available through the Skrew source. I’ve tried to install skrewcommon and iToday in the past to no avail. After reading this article today, I tried once again and on two ocassions the process in th app installer seemed to complete but instead of going back to the categories screen it and letting me respring, it would crash out and go back to springboard. I rebooted phone and got stuck on apple logo. I hard reset the phone and it came back with itoday on springboard but as before even when turned on, nothing appears on my lock screen. I thus tried to uninstall it but is NOT on the uninstall section of app installer!!!! I’m not sure how to properly use SSH solution to manually get rid of it or where to look for its files. right now I’ve basically hidden it with the customize option but it’s really aggravating that it’s there and can’t be properly uninstalled!! Does anyone else have problems after installing the SkrewCommon update? I can start apps but nothing is responsive afterwards except the home key, so I can’t even uninstall it after it’s on. I’ve had to restore my phone 3 times today, and I’d really like to use vWallpaper and Ringtones, so if it’s a common problem I’d like to know. Same happened to me. But Ihave already uninstalled intelliscreen before installing Skrew. I SSH into the iPod touch and removed anything that had Skrew in the file name and *.plist with name Skrew in it. (ie. /private/var/root/Library/Preferences and /private/var/mobile/Library/Preferences and etc.). Moved the skrew folder fro /mobile/media to my pc. Then I rebooted the ipod in normal mode using Ziphone. Now its o.k. Again going to install skrew and vwallpaper. don’t know what will happen. Applying patch, please wait, this can take up to 30 seconds…After the patch is complete, SpringBoard will be restarted. If you wish to revert back to the original SpringBoard, simply run the sb_unpatcher instead of sb_patcher. i added the source for this prog, but i dont find it, is there another source to download it? I have the same issue. I have found iToday but no SkreCommon?